my little favourite DIY: Cookies & cream ice cream layer cake for Bake Along #25 1st Anniversary Layer Cake. Cookies & cream ice cream layer cake for Bake Along #25 1st Anniversary Layer Cake. Free and Easy Bake Along 1st Anniversary!! 2) Fold in melted butter till combine. Pour mixture into 2 9"x9" greased and lined baking tray. 3) Bake in a preheated oven at 180c for 15-18 minutes each. Remove and cool the sponge cake on wire rack. 1) Beat A till well mixed and slightly pale. Bring B to boil at low high. Remove and add in A and mix well. 2) Double-boil this mixture until it is slightly thicken. Remove and cool over a cold water, keep stirring till cool and set aside. 3) Whisk non dairy whipping cream until stiff. 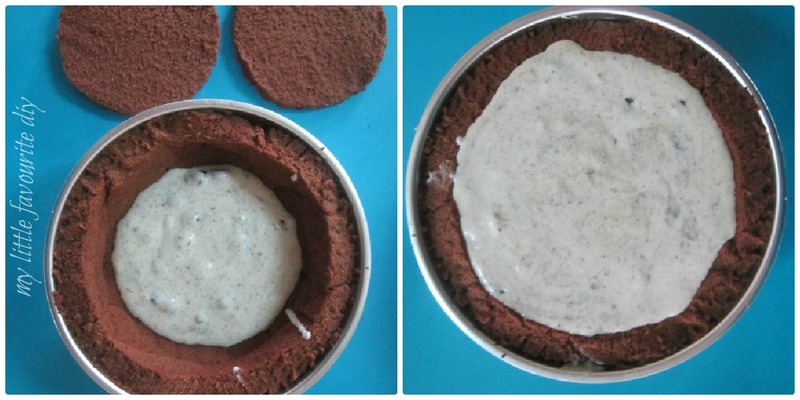 Fold into (2) mixture, add in vanilla essence and crushed Oreo biscuits. 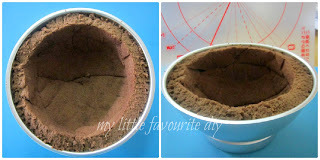 BUT i am making a layer ice cream cake..
1) I used a semi sphere baking mould to do this. Put the mould onto the sponge cake and cut out the round shape. 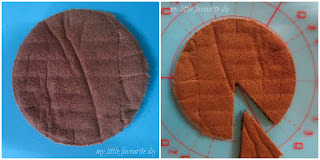 2) Cut out 1/8 from the round sponge cake. 3) Place the cake into the hemisphere mould. It should fix nicely. 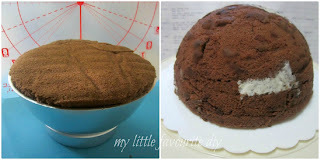 4) Spoon ice cream onto sponge cake, filling 1/2 full and place a piece of smaller round sponge cake on top. Again spoon the remaining ice cream onto the sponge and cover with another piece of sponge cake. 5) Freeze the cake for about 2 hours. Unmould the cake and spread the cake with whipped non dairy whipping cream. 6) I make the pumped icing flower into two tone. 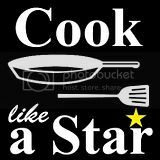 This is how i do it. Fit the piping bag with a flower tip. Fit the piping bag onto a tall glass like the one in the above picture. 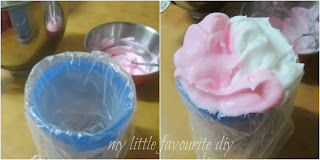 Filled one side of the piping bag with white whipped cream(icing) and filled the other half with pink whipped cream. When you pumped the whipped cream onto the cake, the flowers will appear two tone. After finish decorating the cake, put back into the fridge until it is ready to serve. This is the Cookies & Cream Ice Cream Layer Cake. ~does this look like a bouquet of flowers?? It is pretty, it is nice and it is amazing. Love the white and pinkish colour. I'm sure Lena, Zoe and Joyce is very delightful seeing your post. Doreen, this is beautiful! Looks like a lot of work too. I would love to have a bite. Thanks for the amazing tutorial! Fab 1st Anniversary Cake You Made There!! This is beautiful. Very pretty cake. Wow, Mui Mui, this cake needs a lot of good skill to make! Well done, girl! Looks like there is lots for me to learn here! hi doreen, this is really beautiful and i'm sure it taste wonderful! that's a great step by step tutorial, very helpful..now i get a picture how you did this! thank you for putting up the tutorial pictures and thanks for joining again! Mui mui , I'll visit u more n more too. Another beautiful cake made by mui mui! Bravo! Yes, this do need a little bit work. 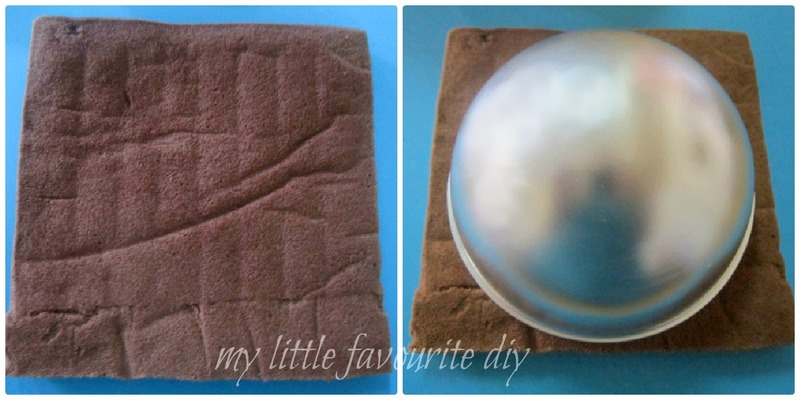 I am glad that you like the tutorial pictures. I am glad I manage to complete this cake. It does need a little patient making this cake. I am so happy I have the recipe book to do this. Hi Mui Mui, wow ,...your cake look so cute and pretty. Love the beautiful color of pink and white. Can pass me 1 slice, please? I've never made an ice cream cake before and I love the shape of this. And it's just so pretty! 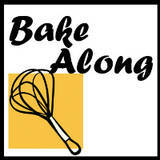 I really enjoy baking with youS three lovely ladies in Bake Along. Thanks so much for hosting such wonderful event. Thanks for compliments and thanks for dropping by. Hi Mui Mui, have you pick your books from Amazon? I pick 2 books 1) Cakes & cakes decoration by Angela Wilsen, Martha Day, Sarah Maxwell USD 19 ( hard cover with 600 recipes) and 2) Cupcake 150 recipes by Carol Pastor USD 10.39. So both combine is slightly less than USD 30. Hard to find single book that are USD30, so I requested from Stephane for 2 books.